Wooden swimming pool kits are quick and easy to construct and create a beautiful pool that will blend in with any garden. 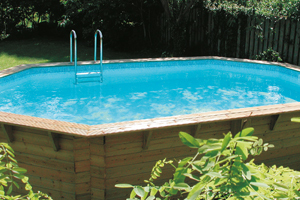 Wooden swimming pool kits provide a quick and easy way for anyone to have a beautiful looking pool in their own garden. The wooden pool kits can be ordered in a range of styles and sizes or even custom built to your own specification. These incredibly versatile pools can be built as an above ground pool or sunk in ground to all or just a part of their depth. They are made from sustainably sourced timber, which is pressure treated to protect against rot and insect attack and so gives your pool a good, long life span. The pool kit comes complete with all the fixtures, fittings, pumps and filtration that you need to have a finished pool in your garden within a few days of starting the project. The pool kit is delivered on a couple of palettes and will contain everything you need to build your pool. If you intend to have the pool in, or partly in ground, then the excavation work should of course be done before the delivery, and to the correct dimensions. If the pool is going to be an above-ground pool then all you need is a flat, level surface for the pool to sit on. The sides of the pool will be supported by four or more metal stanchions and these should be sunk into the ground, appropriate to the dimensions of the pool. The pool kit instructions from the manufacturer will give you details on where these supports should be placed relative to each other and the finished pool. The ground where the base of the pool will sit should be covered with sand and levelled off. The sand protects the pool liner from rocks or stones that could cut or puncture it when filled with water. The sides of the pool slot together somewhat in the way of a log-cabin with cut-outs at the ends of each section that slot into each other making a strong framework. These pre-cut timber sections are light enough to be manoeuvred single handed and no carpentry or woodworking skills are required to join them together. Once the sides of the pool have been raised to the correct height, and the fittings for the inlet and outlet water pipes have been installed in the pre-cut holes, a cushioning liner is applied before the vinyl pool liner goes on top of that. The equipment pack of pump and filter is relatively easy to fit and plumb in but you may wish to use a plumber or pool professional to do this and you will certainly need a qualified electrician to complete the final wiring. With their ability to be either above-ground or partly in-ground, wooden pools can look fantastic when surrounded by differing levels of decking. The wooden decking and the structure of the pool itself blend together and give a cohesive and attractive look to the whole pool area. Steps between changing decking levels and wooden railings can quickly create a stunning feature that can be the centrepiece of your garden as well as your lifestyle. Bold and dramatic planting with giant grasses or bamboos can soften edges and make the pool and the decking blend in to the rest of your garden or you might choose to run the decking right up to your house and create an area for socialising and relaxing, right outside your back door, that features a pool sunk into that deck. For the truly health conscious and exercise minded, wooden pools can be fitted with a BADU counter-current unit that provides a variable current to swim against allowing you to have what effectively becomes an ‘endless’ swimming pool. As an alternative to the wooden pool kit, Swimmer Pool Kits take the worry out of specifying exactly the pool that you want. They bring together all the heating and water filtration equipment that you will need and they use a modular construction method that is both quick and dependable. Swimmer Pool Kits contain everything that will be necessary for the pool of your dreams. The pool itself is built from modular side panels that quickly lock together and are supported by X-frame buttresses. The actual walls of your pool can go up in just a few hours. Your Swimmer Pool Kit will include a powerful and reliable pump that is appropriate for the size of pool you have chosen. There will be a filament-wound water filter and a MultiCyclone pre-filter. Your pool heater can be specified as gas, oil, electric, solar or even using a heat pump. And just as importantly, the kit will contain all the fittings and pipework that will be needed. Every component has been sourced from the best possible supplier. Everything in the kit will work together and fit together. Everything arrives at the same time. All this means that you can start bringing your dream pool to life without worrying about delays or disappointments. Swimmer Pool Kits come in a range of 24 different sizes. Starting at 20’ x 10’ and going all the way up to an impressive 40’ x 20’. All of the poolside walls are 4’ deep although the water depth can be increased by incorporating a hopper floor to produce an area of the pool deep enough for safe diving. If you would like some specific advice on wooden pools or would like to find an appropriate pool professional in your area, to discuss the option of a Swimmer Pool Kit, there is a contact button to the right of this article that can get that process started. If you would like to add to this article or comment on it, perhaps with your own experience of wooden pools, then please use the reply box below.